Several factors have many thinking this year will see a spike in IT spending. For businesses that are investing in their IT infrastructure, there are a few things to consider to get the most out of your IT purchases in 2018. Am I getting the best deal on my IT equipment? The more competitive the market, the better deal you are going to get. If you are a global enterprise, it is import to locate where that market is. In most cases, the US or UK will give you the best deals on IT equipment. In a less competitive market, there is no reason for the reseller to bring down price. This results in IT buyers paying a premium even though the same exact gear is being sold. The businesses that buy domestically in large volumes and work with a global logistics partner to deliver the gear globally, have seen significant cost savings. Am I architecting my infrastructure to meet my customers/clients demands? IT departments can fall into the trap of being reactionary to the needs of the enterprise and customer. This is not ideal, especially as continuous innovation demands IT infrastructure managers to be proactive and forward looking. To be proactive, IT departments need to play a larger role in the success of the business. This means IT spending and network design must be directly connected with the strategic direction and goals of the organization. A centralized hub that sources and fulfills IT infrastructure hardware will bring a strong sense of direction and continuity to the global network. In this way, the enterprise IT network can be built in line with the goals and needs of the business. Am I building the right partnerships with manufacturers, OEMs, and VARs? It is important to find technology manufacturers and resellers that work in your best interest. Many will explain that importing technology into X,Y, or Z country is impossible, thereby making purchases in country X, Y, or Z from a local VAR the only option. This is the case because your partner is either unaware of the options from the USA or they are protecting the international “channel” and its profit interests. Partnering with VARs that have direct relationships with global logistics and import services can allow businesses to take advantage of all the benefits of centralized purchasing. By purchasing IT equipment at discounted prices domestically, you can work with an international logistics partner to import the IT gear into all your international offices and data centers. What does a logistics partner have to do with my IT infrastructure? An experienced global logistics provider allows you to take advantage of domestic pricing. The IT equipment you purchased for your global offices can then be delivered seamlessly with the right partner. FGX provides a fully managed global logistics solution that allows you to import your IT hardware into over 130+ countries. We specialize in making sure your IT equipment is delivered to your international offices or data centers, with little to no effort by your international colleagues. If you would like to find out more about are global logistics and import services for your next purchase, please contact us at hello@fgx.com or 212.352.9390. A global technology services company need to perform an IT refresh for their San Jose, Costa Rica office, but wanted to import the hardware from the USA. To do this, they required a technology deployment partner that could simplify Costa Rica’s complex import process. They also required an Importer of Record Service, as their local business entity was not a registered importer in the country. The client was able to purchase the gear they needed for Costa Rica with other domestic hardware, increasing their buying power with their VAR partner. After analyzing the costs it was clear that acquiring the gear domestically in the US and shipping to Costa Rica would be faster and more cost-effective than trying to source the gear in country. FGX’s understanding of the full customs process allowed us to prepare documentation and manifest the shipment prior to departure, resulting in a smooth import process. In San Jose, our local team worked directly with customs officials to clear the shipment. Our importer of record service allowed us to manage the entire import process on the client’s behalf. Our fully-managed solution allowed us to deliver the gear in 2 weeks without any involvement from the client. We managed the entire process allowing our client to focus on the implementation of the hardware once it arrived in the San Jose office. The success of this shipment has lead the client to regularly partner with FGX to deliver IT gear to their other international offices. The rise of the Internet of Things (IoT) has led to a dramatic increase in the creation of data. It is clear that the practice of pushing data analysis processes onto the “cloud” or end-user devices is showing its limited capability. To better distribute workloads and handle greater volumes of data, the processing and analyzing of data has begun to move to the edge of networks in the form of micro data centers. Edge computing optimizes cloud systems by setting up micro data centers that process and analyze data where it is generated. This method of computing reduces the distance and the volume of data that needs to move through the network. The result is a significant decrease in transmission costs, lower latency, and improved quality of service. Seeing the benefits of an edge computing system, many businesses are now pairing their clouds with strategically placed micro-data centers. To maintain a tactical advantage in data processing, end-users have been actively looking to build and maintain a micro data center environment, often with the latest in hyper-convergence technology. This means keeping up with the latest in data center technology through constant infrastructure refreshes. For VAR sales teams, this means a shorter sales cycle, higher revenues, and better margins compared to core data center deals. The VARs that can design the right solutions for their clients will see an uptick in this business in the coming years. This also presents an opportunity for VARs to distinguish themselves as a trusted business partner. VARs can win clients by proving they can truly support micro data center infrastructure by being flexible, agile, and meeting just-in-time deployment timelines. Working with a global logistics provider experienced in executing just-in-time shipments of IT hardware will be beneficial in meeting these demands. At FGX, we do just that. We position ourselves as a global logistics and consulting layer that you can add to your sales and procurement processes. When a client needs to set up or refresh a micro data center you can confidently deliver the hardware they need, where they need it. If you would like to find out more about how we can provide global logistics and consulting services for your next deal, please chat with us or email us at: hello@fgx.com. A global social media giant needed to urgently deliver IT hardware to their Jakarta office. After experiencing delays on past shipments, they were looking for a logistics partner that could provide a time-sensitive solution into the country. They also required an Importer of Record Service, as their local business entity was not a registered importer. Southeast Asia’s largest economy is one of the world most exciting emerging markets. A fast-growing young population with a financial system heavily backed by a pro-market central government makes Indonesia a golden opportunity for global businesses. As evidence, 2017 saw the largest net inflow of direct foreign investment in over 7 years. Importing goods into Indonesia requires an importer license. A business entity without an import license cannot import goods into the country. A business can either apply for an import license or utilize an Importer of Record service to import into the country. Our client’s major concern was time. To accommodate the project timeline requirements, we planned the most effective route to minimize transport and customs clearance time. Upon arrival in Jakarta, the shipment was immediately lodged into customs. was delivered the following day. By partnering with FGX, the IT equipment arrived ahead of schedule with little to no client involvement. Knowing that it is possible to effectively shipment IT infrastructure into their international offices put the client in position to strategically set up and refresh their global network to directly support their business. At FGX, we have seen that purchasing domestically and deploying IT hardware to international offices or data centers can save you time and money. To learn more about our “Buy Local – Ship Global” methodology, read our recent client success stories, or contact us today! A global provider of collaborative workspaces needed to deliver personal computing devices to their offices in Buenos Aires. They were under a tight deadline to provide new employees with an onboarding package including laptops, monitors, and accessories. They required a logistics partner experienced with Argentina’s import restrictions along with an Importer of Record service, as their local business entity was not a registered importer. At the turn of the millennium, the Kirchner era’s “Make it in Argentina” protectionist policies closed the country off from much of the world’s economic activity. Importing electronics became a nightmare with high tariffs and strict regulation and compliance requirements. The election in 2017 saw a new regime promising free-market reform come to power. They have begun to reduce tariffs and regulations, but Argentina still remains highly regulated. These new economic developments have convinced some foreign entities to invest in Argentina once more. FGX worked closely with local customs experts to obtain the documentation required to import electronics into Argentina well before the devices arrived at our transfer station. We managed all documentation on behalf of our client’s head office in the USA and local office in Buenos Aires. Imports of electronics need to be approved on both the product and importer level. This means even though a specific device was approved for import into Argentina in the past, each new importer must complete the approval process, which can take up to 90 days. To avoid this waiting period, electronics with external or removable power supplies can be imported (as long as the power component is removed). FGX’s IAC status allows us to work with any major commercial or cargo airline. This shipment was booked on a flight from New York to Buenos Aires and arrived at the destination airport within 3 days. Upon arrival, the shipment was immediately lodged into the customs process. FGX’s local team in Buenos Aires is highly experienced with importing consumer & enterprise grade electronics. Our local business entity is a frequent importer and was able to clear the shipment through customs in 5 working days. After clearance, the shipment was administratively transferred back to the end-user and delivered the following day. The alternative to importing equipment with a partner like FGX is sourcing in-market. This process of procuring consumer & enterprise grade electronics locally in Argentina can be very difficult. Strict protectionist policies limit the number of technology resellers, causing the supply to be low and inventory to be dated. To further complicate matters, non-authentic items are common, resellers typically hold limited inventory and cannot fulfill enterprise orders on demand. To make up for the missing inventory, once an order is placed, the vendors proceed to import the rest of the products needed, leading to lengthy delays. Local vendors may also not be fully transparent about their inventory up front, which makes in-market sourcing a non-optimal option when under a tight deadline. By partnering with FGX, the client was able to purchase the exact equipment they needed in the US, and deploy it into Buenos Aires in 2 weeks. FGX removed the power supplies from the laptops & accessories to facilitate a smooth customs clearance process. We then procured the power supplies locally and delivered the completed onboarding packages to the client’s local office. The client was ecstatic that their growing team had the tools they needed to support their rapidly expanding footprint across Argentina. In order to meet the growing technology requirements of users and stakeholders, Shadow IT practices emerge as IT managers take it on themselves to procure hardware outside the direct funding or control of the CIO’s organization. Accepting this type of Shadow IT practice presents a direct threat to the CIO and the enterprise in several ways. When IT managers across the company start developing their own relationships with their local VARs, CIOs (or equivalent) lose control over the entire IT procurement process. IT managers that buy locally for their own needs fail to take into account how their purchases impact the broader enterprise. Without control of IT spend and the physical network, IT infrastructure planning becomes nearly impossible for the CIO. IT managers will purchase different IT solutions for their specific needs. Without going through a centralized approval process, divergent hardware will enter the global enterprise network. Failing to control the devices entering the network, the CIO opens the enterprise up to potential security issues and system downtime triggered by unapproved hardware. A lack of coordinated purchases inevitably leads to wasteful spending across the global network. The stockpile of Shadow IT equipment becomes an inventory problem. Instead of creating value, the inventory sits on the balance sheet depreciating in value every day. The IT department ends up having to spend resources trying to re-purpose gear or they just eat the sunk cost. A business can switch to a centralized procurement methodology to decrease Shadow IT costs drastically. A central technology request system will provide IT managers with timely hardware solutions and allow the CIO to advance goals of the overall business. A centralized request system will decrease the cost of coordinating hardware deals with VARS and manufacturers. Instead of a chorus of voices, a central voice can coordinate critical IT infrastructure deals. This will allow the CIO to implement long-term strategic infrastructure planning that focuses on controlling costs and increasing network efficiency. Through a centralized procurement system, a company can purchase the necessary equipment from select VARS and manufacturers to boost network capabilities and eliminate disruption from Shadow IT. With control of the physical IT infrastructure, the CIO can strategically maneuver the network to effectively support their businesses around the world. By consolidating IT hardware requests, a company can take advantage of economies of scale and the deep discounts found in competitive VAR markets like the United States. The international markets where Shadow IT is purchased charges a premium for IT hardware. Bypassing the international markup and purchasing locally, then shipping globally, will save the enterprise money and eliminate Shadow IT. A centralized procurement method of purchasing domestically and deploying IT hardware to international offices and data centers is only possible with the right global technology logistics partner. Combining the deep discounts of domestic purchases with a trusted partner like FGX (providing door-to-door logistics and project management expertise) will save you valuable time and money. To learn more about our “Buy Local – Ship Global” methodology, read our recent client success stories, or contact us at hello@fgx.com. Member states of the Gulf Cooperation Council (GCC) have enacted a Unified Agreement for VAT (Value-Added Tax). This agreement creates the framework for the implementation and operation of a VAT across all member states. It is up to each member state to implement the framework through legislation or other processes. Saudi Arabia and the UAE have been first to announce a VAT to take effect on January 1, 2018. This will directly affect businesses importing goods into GCC countries. 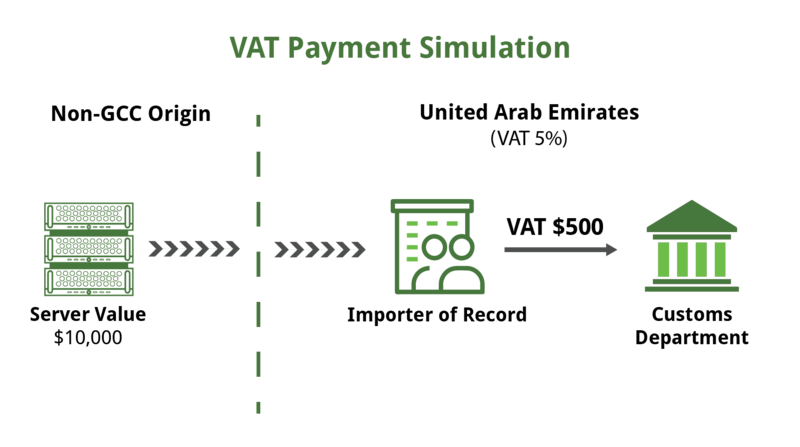 What does it mean for you and how can you prepare your business operations to be VAT ready? Value-Added Tax is a consumption tax that is placed on the value that is added at each stage of the supply chain from production to the end consumer for a good or service. Instead of a sales tax that collects all consumption tax at the end of the supply chain, this tax is distributed along the whole supply chain. VAT is used in many countries around the world, but is most commonly seen in the European Union (EU). The GCC VAT framework is most commonly compared to the EU. When a server with a Total Import Value of $10,000 enters the UAE, a VAT of $500 (5% of $10,000) is levied to the UAE VAT Registered business. The $500 goes directly to the customs department upon arrival of the server. VAT registration is mandatory for businesses or individuals with supplies exceeding SAR 375,000 in a 12 month period. VAT registration is voluntary for businesses or individuals with supplies exceeding SAR 187,500 in a 12 month period. VAT paid for imported goods can be reclaimed at the end of each tax period by registered members. Specific VAT tax compliance requirements (Tax groups, record keeping, tax periods and deadlines) will be left to each member state. VAT-registered and unregistered businesses are required to pay VAT on imports to the Customs department upon arrival of goods. If you are unable to prove a previous VAT payment from another GCC for a specific import you will have to repay the VAT. The Place of Supply, where the tax levied, for wired and wireless telecommunications and electronic services is determined by where the customer resides. The VAT presents a extra 5% upfront cost to anyone importing goods in GCC member states. This will be reflected in the pre-shipment payment businesses will pay logistics/import service providers to ensure DDP incoterms. It is important to remember this VAT is reclaimable with the proper registration and documentation when your company is the importer of record. With the corresponding import receipt, your accounting team can reclaim the 5% VAT paid during importing. When using a third-party importer of record service, VAT reclamation is not possible. Businesses will need to be compliant with VAT registration and specific procedures. If your business exceeds mandatory and volunteer thresholds, you will need to become VAT registered by completing a Tax Registration application in 30 days of importing goods. Also, operations procedures and systems must be updated to follow record keeping and reports procedures to redeem VAT tax credits after each tax period. With the Gulf Cooperation Council VAT on the verge of being implemented it is critical for your business prepared all departments and upgrade systems asap. A value-added technology reseller of networking and data center cloud services needed to deliver IT hardware into a Data Center into Tokyo to increase their capacity in Japan. The client had some past experience in Japan but did not fully understand the import requirements associated with importing technology into the country. The client contacted FGX with the understanding that purchasing their equipment in the United Kingdom and shipping it into Japan was a more cost effective solution. FGX’s Importer of Record service, along with our door-to-door IT hardware deployment solutions made FGX an ideal partner for the client. FGX collected the data center hardware in London and moved it to our designated UK transfer center. Once at our transfer center, we ran a full manifest check to ensure equipment accuracy. We also confirmed that the hardware met all import standards in Japan. Next, we booked a direct flight from LHR to NRT with our airline partner. The shipment was on its way to Japan the next day. When the shipment arrived in Japan, FGX managed the Importer of Record process. We then arranged for customs clearance with all the required documents and authorizations. To import technology into Japan, the shipping documents must accurately reflect import requirements and the hardware must pass product testing standards. Paperwork is reviewed based on the Japanese Measurement Law. Any inaccuracy or contradiction in the import or product documents can lead to fines or delays. The hardware must indicate it has passed product tests with a PSE label affixed. We worked directly with the manufacturer to procure the proper certificates showing technical approvals for all of the gear in the consolidation. Accounting for all import requirements and approvals, FGX was able to facilitate a seamless import of technical hardware into Japan with zero client involvement. Partnering with FGX, the entire door-to-door IT deployment took about a week. FGX managed the entire approval process, enabling a smooth customs clearance. Our project management approach kept all stakeholders in the loop every step of the way. FGX even handled the acquisition of the data center delivery ticket required to complete the final delivery. When procuring IT equipment for your next technical infrastructure project in Japan, or any other international market, consider a centralized procurement strategy. Combining the deep discounts of domestic purchases with a trusted partner like FGX (providing door-to-door logistics project management expertise) you will save valuable time and money. An international telecommunications company based in the UK was having problems buying through VARs in the Middle East. The client was looking for a logistics partner that could navigate Jordan’s stringent customs clearance process, as they wanted to buy their gear in places other than Jordan, and ship the gear in. FGX’s local team picked up the equipment in London and transported it to our UK transfer station. Once at our facility, we ran a cross check to ensure that the equipment met all standards in Jordan. We also confirmed with both the manufacturer and UK government agency that the technical gear did not need a UK export license. After finalizing the paperwork, we booked a direct flight from LHR to AMM and the shipment was on its way to Amman the next day. The client was not registered to import this type of equipment into Jordan, thus FGX managed an importer of record process on behalf of our client. While managing the customs clearance process we worked with the TRC (Telecommunication Regulatory Commission). We facilitated the TRC approval process for each telecom device with no involvement needed from the client. FGX interfaced with both the manufacturer and TRC inspection agents, to present the proper customs documentation, commercial invoicing, and data-sheets, resulting in a prompt customs clearance. Once the shipment cleared, the gear was delivered to the client’s local office in Amman. Shipping from the UK to Jordan is difficult. FGX completed the London to Amman, door-to-door deployment, in 5 business days. This delivery time line impressed the client. Please think of FGX when procuring IT equipment for your next technical infrastructure project in Jordan. You should also consider a centralized procurement and global deployment model in general. Combine the simplicity and discounts of centralized purchases with a trusted partner like FGX. When we provide post-sale deployment support, you will save valuable time and money.